As we close in on Christmas, we like to “Christmas-ize” our food, adding red and green garnishes to everything from scrambled eggs (green and red bell peppers or jalapeños) to desserts (mint leaves and raspberries). We have fun doing it, looking for a different red and green combination at every meal. For sandwiches, we plate the lettuce and cherry* tomatoes next to the sandwich for presentation purposes, providing a fork so everyone can move them to the sandwich without fingers. Instead of drab green pimento-stuffed olives, we garnish the plate with bright green Castelvetrano olives with strips of pimento. You can also take the “cookie cutter” approach to savory foods, using your holiday cookie cutters to shape everything from bread (star- or Christmas tree-shaped toast or PB&J, for example). Or use the cookie cutters as molds to shape food (grains, for example) on the plate. Here’s how we garnished three of our favorite foods: fish/seafood, pasta and sushi. It’s easy to garnish any fish dish with pearls of green and red tobiko (flying fish caviar). 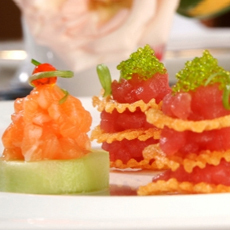 But in this salmon and tuna tartare recipe, we shaped the tartare into Christmas trees. You can make the tartare with fish or beef (here’s a beef tartare recipe), or make some of each for a nifty surf and turf first course. The cucumber-base version can be readily picked up from an hors d’oeuvre tray. 1. BLEND together olive oil, wasabi, sesame seeds, pepper and salt. Add fish and toss until evenly coated. 2. ADJUST seasoning as desired with additional wasabi powder, pepper and/or salt. 3. ASSEMBLE on cucumber and potato chip bases as shown in photo. 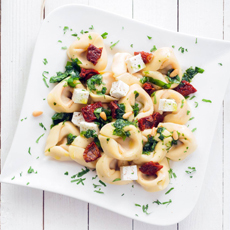 You can make this dish with any pasta, but the curved tortellini and the cubes of cheese are a nice counterpoint. You can blanch the greens or use them raw; you can serve the dish hot or at room temperature (like pasta salad). TOP PHOTO: Tuna tartare Christmas trees; photo courtesy Bemka. SECOND PHOTO: Tortellini from Bella Sun Luci. 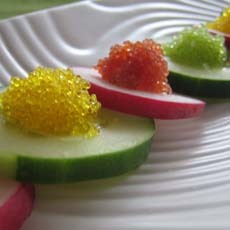 THIRD PHOTO: Use red and green tobiko (flying fish roe) as a simple garnish; photo Melody Lan | THE NIBBLE. 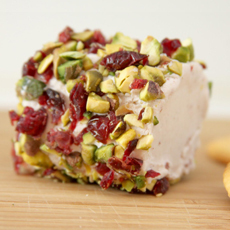 FOURTH PHOTO: Dried cranberries and pistachio nuts on a goat cheese log, at MoreThanHungry.com. 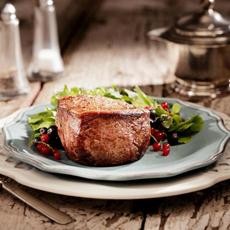 BOTTOM PHOTO: Filet mignon with a red and green salad from Double Ranch. 1. COOK the pasta and blanch the greens, as desired. While the pasta cooks, cube the mozzarella. Have all other ingredients ready to add. 2. DRAIN the pasta. Return to the empty pot and add the other ingredients (except garnish), adding just enough olive oil to help bind the ingredients. Toss to blend. Taste, and add salt and pepper as desired. 3. PLATE, garnish and serve. You can add red and green garnishes to any fish dish, raw or cooked. 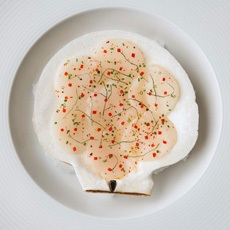 In the photo of the raw scallop appetizer, it’s simply herbs and spices. Alternatively, you can pomegranate arils and pistachio nuts, drizzle red grape or cherry tomatoes with a green basil oil, or bell peppers, raw and diced small or cut into strips and sautéed. The photo shows a non-edible scarf and hat. We’ve substituted edible versions in our recipe. We purchase the California Rolls at the supermarket or get take-out from our corner sushi bar. 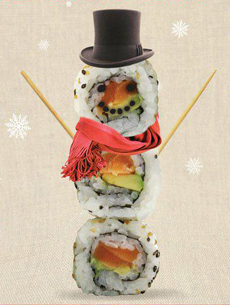 You can assemble a standing snowman by slightly flattening the bottom piece, or simply arrange it flat on a dark colored plate (for contrast with the white rice). 1. CREATE the face on the top piece: eyes, nose and mouth. Use the bit of carrot as an optional nose. 2. STACK three California roll pieces. For a standing snowman, use toothpicks to join the pieces. 3. ADD toothpicks as arms. 4. ADD optional “clothing”: red scarf and hat. For a hat, affix two crackers in a perpendicular fashion with cream cheese. If using a green onion scarf, blanch it in boiling water to make it easier to tie. Check out all the different types of sushi in our beautiful Sushi Glossary. *When tomatoes are out of season, cherry and grape tomatoes, raised in hothouses, have the best flavor.